It might be that they were singing because they were not going to war. It’s a sad thought that there was only one ukulele among the eleven prisoners. We cannot blame the youngsters. It is a great deal more pleasant to sing Tira Mola with the accompaniment of an Ukulele, to standing over the wash tub or broiling a piece of steak. And it is far more interesting to play baseball in the presence of admiring girls than to stay at the bellows in the blacksmith shop or hit a hot iron on the anvil. It is natural for the young people to shirk work. Just seems that the ukulele is associated more with fun than work, even when the uke is only a means of recreation after a hard day at the anvil (or the English Channel). Did the ukelele inhibit her free-style? Ms Gertrude Ederle denied that her ukulele playing in anyway contributed to her failure to make the swim across the English Channel (The News, 17 September 1925). Her trainer, Jabez Wolffe, claimed that she neglected her training to play the happy little instrument. “That’s a lie,” said Ms Ederle. “I played my ukelele only during the evening after the day’s training had been concluded. It was my relaxation.” She insisted that she had done everything in training that her coach had required. Ms Ederlie’s first attempt failed when her trainer ordered another swimmer to take her out of the water. He claimed that she was in difficulty; she denied that too. 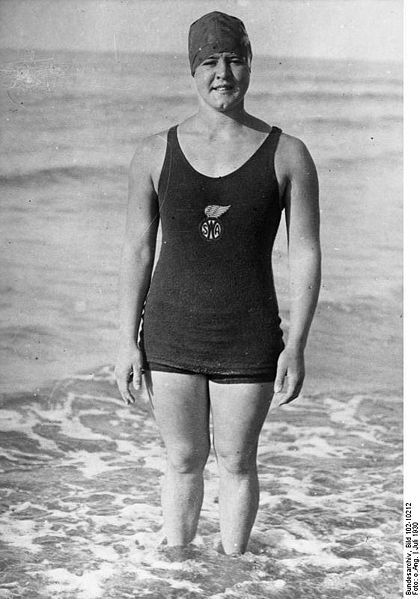 Happily, in 1926, she succeeded in her second attempt at the channel, finishing the swim in 14 hours 30 minutes and breaking the previous record (held by Enrique Tiraboschi) by about 2 hours. Her record stood 24 years. – then down again until the more recent rise in the 1990s. The word ‘ukelele’ seems to appear at a more constant rate across the years with peaks in the 1920s and 1990s/2000s and dip in the 1930s. Why the difference? Who knows. Personally, it could simply mean that I’ve misunderstood things, which is a common happening. The Argus of 6 February 1936 related the news that a chair of guitar playing had been set up in the music conservatory of Madrid by the Spanish Government. The argument for this move was that it would preserve the playing of the guitar against the onslaught of movies and jazz music — apparently young people were voting with their feet, listening to the radio rather than the strumming of folk tunes. This seems to put the idea of a conservatorium in an unfavourable light. It is then the case that, once a thing cannot support itself in the popular imagination, it has to be conserved by government decree. Nevertheless, did the headline of this article (with now forms the title of this post) mean that the jazzy ukulele would now be the popular choice of the young Spaniards, or did it mean that since the guitar has now made the grade for ‘conserving’, the ukulele might someday be ‘preserved’ in a similar way? 2. Remember that slow practice is the study of the gods. 3. Honor your teacher — even if you do believe you know more than he does. 4. Less practice on your instrument — but more thinking and studying away from it will be conducive to greater results and higher development. 5. Embrace every opportunity to play concerted music. If there are no opportunities create them. 6. Keep your ears and eyes open to everything and everybody; in other words, study carefully the method of every artist. 7. Be a musician as well as an executant. 8. Remember that though you may be able to play everything from A to Z it does not mean that you are a musician. 9. Remember that an ounce of tonal quality is worth a ton of technique. 10. Work for your health while working to achieve artistic ambitions; for fresh air, deep breathing and long walks mean renewed vigor and mental activity. — From the Australian Bandsman. “Do you think that jazz music will be taken up by serious composers?” someone recently asked Emil Oberhoffer, conductor of the Minneapolis Symphony Orchestra. If only the American Federation of Musicians could have known about this, Ms Breen’s life would have been more peaceful. Three young party goers were a little under the weather when officer O’Connell found them changing a tyre, according to the Lewiston Evening Journal, 25 May 1926. They were on their way to a dance. The fellow who had been driving the car, obviously intoxicated but bright enough to want to avoid loosing his license, blamed one of his passengers. In court, Edgar Rivard was accused of drunk driving, but he claimed he didn’t have time to drive as he was too busy sitting in the back sit playing the ukelele. Judge Manser was impressed by the fact that the two activities were incompatible, especially if one were tanked. Noble Edgar told the court that, if he had been driving, he “would take [his] medicine like a man”. But all he was guilty of was wobbly strumming in the back of a Ford Sedan.